Top-quality cowhide at fair market prices! 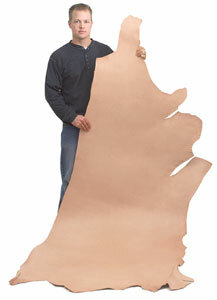 Quality Leather Hides are first-quality natural russet leather, which is ideal for tooling. Full and half sides are 7-8 oz, approximately 1/8" thick. The full side is approximately 20-22 square feet. The lightweight side is 3-4 oz, approximately 1/16" thick, and just right for smaller projects like wallets, coin purses, and wall hangings. It measures approximately 18 square feet. The double shoulder is an 8-9 oz, the perfect thickness for belts 46" to 55" long. It has a rectangular shape.